RECRUIT LETTER -Official Arizona Centennial Legacy Buffalo Soldiers of the Arizona Territory - Ladies and Gentlemen of the Regiment, Mesa, AZ. Years: 2007 to present. 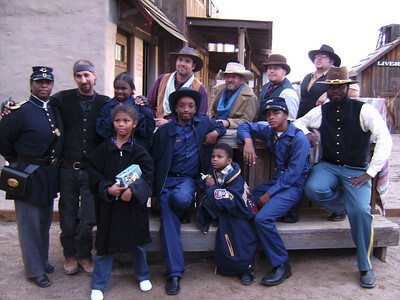 The Buffalo Soldiers of the Arizona Territory - Ladies and Gentlemen of the Regiment is a 501(c)(3) organization who would like to continue to bring the remembrance of the "Buffalo Soldiers" Black History alive from 1866 - 1902 by wearing the (AUTHENTIC UNIFORMS) and to continue to inform the military/veterans, public, schools, churches, outdoors/indoors events or where ever we are needed in the lives of people in the State of Arizona and Nationwide. 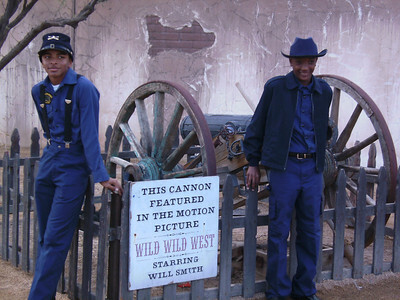 We are volunteers and decided to keep the memory of the "Buffalo Soldiers" history alive, dedicated to delivering a positive family, friends and community education atmosphere. 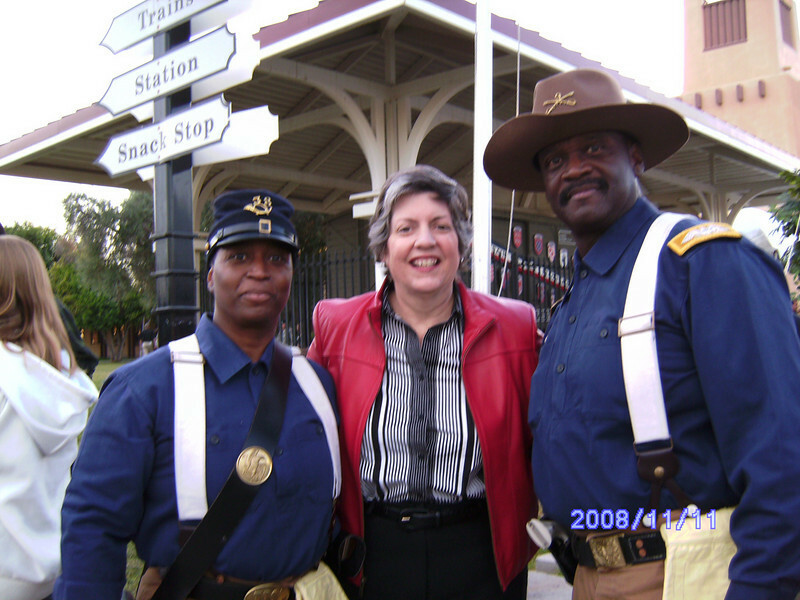 OBJECTIVE: "BE PROUD TO WEAR THE AUTHENTIC UNIFORMS AS THE "BUFFALO SOLDIERS DID WHILE SERVING IN THE U.S. ARMY in 1866 - 1902." "LADIES AND GENTLEMEN OF THE REGIMENT IS ONE OF HONOR, DIGNITY AND RESPECT, PERIOD TIME ERA. To educate our youth and the general public on the history of the 9th and 10th Cavalry (Horsemen) and 24th and 25th Infantry of the United States Army "BUFFALO SOLDIERS". Promote and preserve the history, tradition, and outstanding contributions of the Buffalo Soldiers of the United States of America had established in August of 1866 towards the development, defense and accomplishments. To encourage the study of history from the end of the American Civil War and Indian Campaign Wars, to the turn of the century, in general. Seeking men and women of upstanding characters and morals with a desire to teach OR be a part of a historical organization as a "BUFFALO SOLDIER" or a "LADY or GENTLEMAN OF THE REGIMENT". Every Adult or Young Buffalo Soldier or Young Lady of the Regiment has something valuable to offer. We are confident you will find the experience to be rewarding and fulfilling. Qualification: Seeking Couple, Single and Family. Your participation would greatly help us to shine the light on those who have paved the way for Black Americans today. If you are interested in volunteering in our great organization, please e-mail: mlondon3@cox.net. Please contact Commander Marable at (480) 415-5439 at your earliest convenience. (Double click on the gallery picture for additional pictures and narrative). Meetings: 3rd Saturdays of each month at 1:00pm. Please e-mail us with your Name and Telephone number. Show us that you care about "Keeping History Alive! Reserved all Copyrights and Tradename. Buffalo Soldiers of the Arizona Territory - Ladies and Gentlemen of the Regiment, Mesa, 1st Annual Buffalo Soldiers Formal Ball Dinner, Mesa Historical Museum, October 17, 2009. 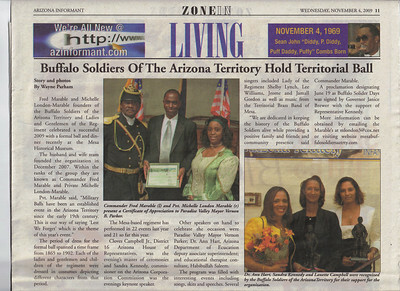 Year: 2010 PROCLAMATION Founders Cmdr Marable and Michelle London-Marable of The Official Arizona Centennial Legacy Project "Buffalo Soldiers of the Arizona Territory - Ladies and Gentlemen of the Regiment, Headquarters Mesa, Arizona" awarded the PROCLAMATION: June 19, 2010. 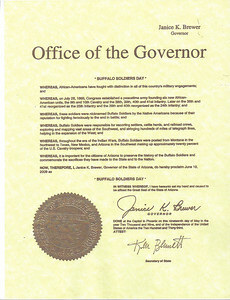 Signed by Governor Janice K. Brewer, State Capitol, Phoenix, Arizona. Other Proclamation Years: 2009, 2010, 2011, 2012 and 2013. 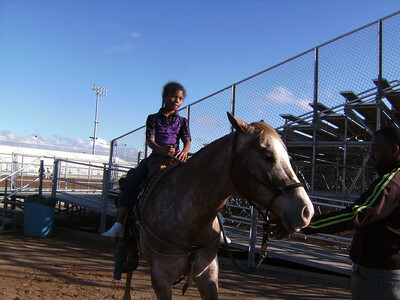 RAWHIDE "Bill Pickett Rodeo". Buffalo Soldiers of the Arizona Territory and The Arizona Roughriders. Year: 2011 PROCLAMATION Founders Cmdr Marable and Michelle London-Marable of The Official Arizona Centennial Legacy Project "Buffalo Soldiers of the Arizona Territory - Ladies and Gentlemen of the Regiment, Headquarters Mesa, Arizona" awarded the PROCLAMATION: Buffalo Soldiers Day, June 19, 2011. Signed by Governor Janice K. Brewer, State Capitol, Phoenix, Arizona. "Good Morning Arizona". Mesa Old West Day, Downtown Mesa, AZ. L/R: Pvt. Michelle London-Marable, Cmdr Fred Marable, Sgt. James Gwin, Brittany Shipp 3TV News Reporter, Sgt. Edward Reece and Sgt. Major Charles Young. RAWHIDE "Bill Pickett Rodeo" Wild Horse Passes, Chandler. Young Buffalo Soldier taken a break before the second show of the Grand Entry. 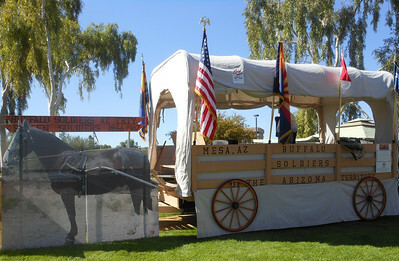 Veterans Day in Scottsdale, McCormick Ranch. Pvt. Michelle London-Marable, Gov. Janet Napolitano and Cmdr Fred Marable. RAWHIDE "Bill Pickett Rodeo" Wild Horse Passes, Chandler. Young Lady of the Regiment taken a break before the second show Grand Entry. 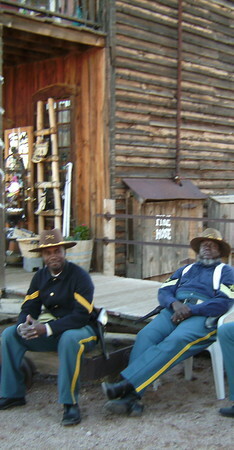 Buffalo Soldiers of the Arizona Territory just chillin at Ghostfield Ghost Town. 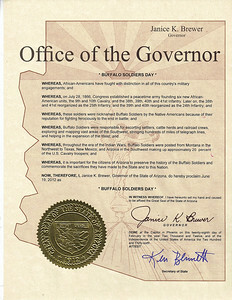 Year: 2012 PROCLAMATION Founders Cmdr Fred Marable and Michelle London-Marable of The Official Arizona Centennial Legacy Project "Buffalo Soldiers of the Arizona Territory - Ladies and Gentlemen of the Regiment", Headquarters Mesa, Arizona" awarded the PROCLAMATION: Buffalo Soldiers Day, June 19, 2012 certificate. 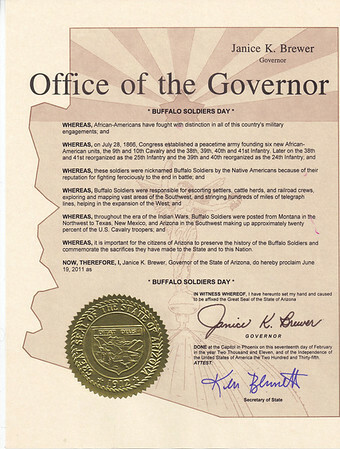 Signed by Governor Janice K. Brewer, State Capitol, Phoenix, Arizona. Other Proclamation Years: 2009, 2010, 2011, 2012 and 2013. 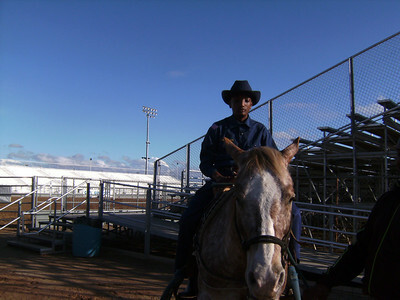 Young Buffalo Soldiers taken a break at RAWHIDE "Bill Pickett Rodeo" before the second show Grand Enty. 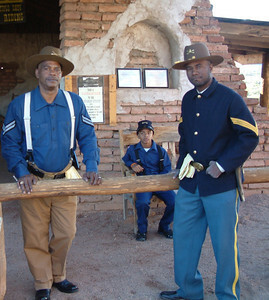 Buffalo Soldiers and Young Buffalo Soldier just chillin at Ghostfield Ghost Town.